Through grueling periods of strength training, you work hard for your muscles. But, when it comes to cardio, which is a must for the track & field athlete, you’re forced to rely on a delicate balancing act since too much cardio can actually destroy your muscle mass. Even in the case of the casual exerciser or fitness enthusiast looking to build their beach body for the summer, this can be a difficult transition. Everything tells you that cardio is the way to burn fat and revel your muscles, but the same threat of losing muscle is still present. Complexes, a unique take on circuit training, may just provide the solution. What are complexes? Can they help you build your cardiovascular endurance while maintaining strength and muscle mass? Simply put, a complex is a string of exercises performed using a single piece of a equipment with no rest between each movement. So you might perform six deadlifts, then with the same weight on the same bar, immediately perform six squats and then move on to the next exercise. Complexes can also be tailored to your training. For instance, incorporating explosive plyometric movements, discussed in a past post found here, can be particularly beneficial for improve cardiovascular efficiency. By including exercises specific to your sport, you can fully benefit from complexes. Try to focus on movements that mimic those of your sport to build up the most important muscles for you. More than strength training or cardiovascular training alone, complexes have the ability to improve your athletic performance on a number of levels. For one thing, because your muscles are being challenged, they will continue to grow and act as the calorie burning engines that they are. The metabolic activity of stimulated muscles, especially when you work your entire body as in the case of a complex, will go a long way in controlling your weight. Complexes also easily replace interval training since the fast-pace involves the entire cardiovascular system. While a runner can totally remove running from his or her training schedule, complexes could allow you to incorporate strength and/or plyometric training without sacrificing your speed and endurance. In fact, complexes will complement your cardio training. But a properly programmed a timed warm-up consisting of a complex has even been shown to improve power output from the muscles during competition. This is because the resistance provided by complexes prime the nervous system for the actual sport. This is particularly effective for ballistic athletes like throwers and sprinters. Again, each exercise is performed with the same amount of weight on a barbell. To start, perform six reps of each, moving seamlessly to the next. When you’re done rest for a whole 90 seconds and do it again, this time performing 5 reps. Continue this routine, with the same rest period, working down to three,two and then just one final lift with each exercise. Have you used complexes in your training? Please share your experience with us in the comments! I haven’t been too lucky in the injury department when it comes to exercise. While I count my blessings each day for having health and strength while others fight hard to survive, I do suffer from the perils of bad accidents, painful joints and cartilage damage. I wish I could say that running is an easy form of exercise every time I head out, but that is not always the case. Today I found myself at the doctor explaining the difficulties I face each time I try to run even a quarter of a mile. I experience trouble breathing and endure extreme dry coughing and wheezing, and feel like someone is sitting on my chest. This obviously isn’t typical for me, otherwise I’d never have run another step in my life. But it is troubling. After examining my breathing ability and asking copious amounts of questions, the doctor diagnosed exactly what I expected: exercise-induced asthma. He prescribed me my first inhaler and then pricked and prodded me with needles for blood work–just to make sure I wasn’t also suffering from hypothyroidism. I’m crossing my fingers the results are negative. Throughout my endurance sports life, I’ve been plagued with a few other instances of injuries. I fell off my bike training for an Ironman race and lost consciousness. I ended up in the hospital with 15 stitches, a sprained wrist and a lifetime of scars. It was a teaching hospital and while I appreciate the value of a hands-on education, I don’t appreciate a Doogie Howser look alike learning to stitch on my face. In a triathlon race, a very fast man crashed into my bike from behind shooting me six feet in the air. I landed on my side with a bike strewn into pieces across the road. I then spent the next three months in physical therapy for the first time, having to relearn how to hold a door knob. This same accident hurt my knee so badly I had to reenter physical therapy a few months later and almost delayed my participation in the Antarctica Marathon–something I waited years to complete. But the most challenging injury of all is my plantar fasciitis. If I wear the wrong pair of shoes just for a few hours, I can’t walk for days. I’ve had my feet turn blue, feel like they’re on fire and seen many orthopedic surgeons over it. Yet, I fill that inhaler prescription because I need to go for a run! In last week’s post, we discussed the importance of taking rest days. But, if you’re anything like me and most other runners, that’s easier said then done. Once you get in the habit of working out regularly, forcing yourself to rest, even just for one day, can be an exercise in self-control. This can be especially difficult if you’re working towards a particularly challenging goal – one that merits more than the average amount of exercise, such as running a marathon. This is where active rest, sometimes called active recovery, becomes a powerful tool. When discussing rest or recovery, it’s important to differentiate between the two forms: active and passive. Passive recovery is what most people think of when they hear “rest.” This would be a day in which you abstain from any form of exercise, completely allowing your body to recharge. Active rest, however, puts a different spin on the whole recovery process. These are days in which you do some form of light activity. Active rest shouldn’t be confused with light workouts, though. Light days should consist of your regular sport, such as running, but at a lower intensity. Active rest days allow you room to cross train instead, and at an even lower intensity than light days. Over training is the enemy of all athletes and is a constant danger. It could slow you down or even take you out of the game permanently. Active rest helps to prevent this by actually aiding in the recovery process. A slight, but prolonged, increase in your pulse will bring more oxygen and nutrients to your muscles. That same blood, as it leaves your muscles, will clear out any waste products that have formed in your muscles during your normal workout. Removing this waste, including lactic acid, will reduce soreness and speed up the repairs that will ultimately strengthen your muscles.You’ll also warming up your muscles, which will help to reduce any stiffness as well. For many people, active rest days can be an opportunity to simply get some housework or yardwork done. The point is to stay active and keep your heart rate up, while still allowing your muscles to repair from your regular workout. You can also do something more formalized, like play sports or engage in a different form of cardiovascular exercise. If you usually run, for example, try going for a leisurely bike ride or swim. An easy walk, lasting about 20 to 30 minutes, is another great form of active rest that will get you up and moving without exhausting you when it comes to your normal sport. Your active rest days are also a good chance for you to work on your flexibility. Both dynamic and static stretching, still lasting about 20 minutes, are a perfect way to keep your muscles limber and still let them recharge. 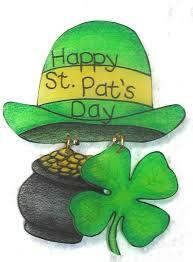 Typically St. Patrick’s Day involves drinking green beer, laughing at inebriated friends, heading to Irish pubs, eating corned beef and of course, wearing that bright color of green. This year I completed a St. Patrick’s Day run to celebrate the festivities in a more healthy way. Although my Irish relatives would want me to spend the holiday in a more proper festive manner, I vowed to make a new tradition that didn’t involve ingesting big plates of mash. Therefore, on St. Patrick’s Day I found myself in a sea of green runners all participating in a Luck O’ the Irish Run. From a fun 5K to a more serious 10K and half marathon, any level could cross a finish line. My favorite part wasn’t finishing another race or burning some extra calories, but the thoughtful costumes. I ran next to a rainbow–two girls dressed up in a rainbow-colored body suit and put their arms together in a U-shape to mirror the half-circle of a full rainbow. In the center between them was a man running with a pot of gold. I also ran past a Lucky Charms cereal box–full human size–a man dressed up as a full leprechaun in a suit (must be hot!) and people with green-colored hair, green compression socks and green tutus. Unfortunately, I didn’t make much of an effort in my appearance, wearing just typical running clothes. I love races like this, races in which people just have fun. It doesn’t have to be about your pace or hitting a PR; it’s more about the festive atmosphere and the beer garden at the end. One of my favorite races takes place in Gilbert, Ariz. called the 12Ks of Christmas (a take on the 12 days of Christmas). At every kilometer mark, a choral group serenades the runners with holiday music. 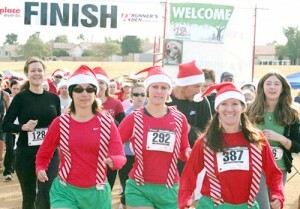 Everyone is given a Santa hat to wear as they run, as well as red socks. But many take it a step farther by dressing up as Christmas trees, elves, dressing up their dogs as mini-Santas to run alongside them and some come in teams of 12 dressed as each day of the 12 days of Christmas. While it is a little too early to think about any kind of Christmas-related run, I do have sweet memories of races that involve costumes. I got to make another memory yesterday with the St. Patrick’s Day race. I plan to come back next year dressed up in green…but what should I be? Posted on March 15, 2013 by First to the Finish Inc. Your workout is meticulously planned. You have your goals and you’re working towards them. On various days, you tend to your strength, endurance and flexibility. But, are you getting enough rest? We seldom think of rest as part of our fitness routine, but it plays a vitally important role in our overall health. In fact, a well-meaning, though overzealous athlete can end up impeding their progress or even hurting themselves by neglecting to rest. Why is it so important? How much rest do you actually need? When you exercise, your muscles are stressed and damaged. Your stores of glycogen fuel are run dry. But during periods of rest, all this damage is undone and your body starts to make changes to adapt to the new challenges. Whether you’re working on strength or endurance, this is when improvements are made. Without the chance to repair and rebuild, your muscles will breakdown, making you lose strength and endurance. This will also increase your risk of injuries. Don’t underestimate the emotional and psychological benefits of rest, as well. These rest days will be a treat, something you can look forward to during a particularly challenging bout of training. It will also leave you refreshed and ready to get moving again. Overuse injuries can manifest themselves in a number of ways, with a wide variety of symptoms. If you’ve been working a certain muscle group, you may experience pain and soreness in the area. For instance, running every day may leave your calves sore and swollen. Over-training can also have a much broader effect, causing problems throughout your body by upsetting certain hormonal balances. Particularly, DHEA and cortisol levels will be thrown into a potentially dangerous imbalance. These two hormones counteract each other to keep things working properly. DHEA builds muscles while cortisol burns it for fuel. In a healthy body, these two hormones are used to control muscle growth in response to stimuli like stress and exercise. In an overworked body, though, DHEA levels drop and cortisol levels spike. This is likely because the body is reacting to what it thinks is a period of starvation or danger by reducing costly actions like building muscle and starting to horde extra fat for fuel. All this can cause exhaustion, mental confusion, moodiness, nutrient deficiencies, and increased blood pressure and cholesterol. Of course, sleep is the primary form of rest. You should be getting no less than eight hours per night since the aforementioned DHEA/cortisol ballet is largely effected by your sleep cycle. But, rest days are also an important aspect of a balanced fitness routine. At the very least, you should allow yourself one day off per week. You may need more, though, depending on your fitness level, genetics, health and overall lifestyle. The best way to judge how much rest you need is by keeping a training log. A detailed account of what you were able to accomplish during your workout will allow you to see how your workout is affected by different situations. For example, if you notice that your mile time increases, it’s safe to assume that you weren’t properly rested and can adjust your routine accordingly. Do you have any tips for working rest into your routine? Please share them in the comments!